This Rummy games glossary is divided into 6 parts and is dedicated to avid players around the world. The first part or introduction is followed by over 100 rummy terms in 3 parts. Following an extensive glossary, there are 3 articles detailing game rules and strategies for Gin Rummy & Oklahoma Gin, Canasta + 5 Online Poker Tips plus 7 Rummy Versions--more to explore. One of the frequent terms used with these card games is meld or run, therefore, the definition is explained here, so that you can better understand this rummy games glossary. Meld: is considered to be 3 or more cards which possess the same suit, rank or that are in a sequence. Example: trio of 10’s or KQJ, all same suit. Also, known as a Run. 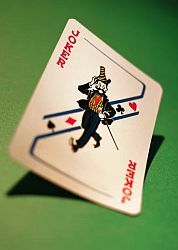 A list of several accepted versions of rummy are Gin Rummy, Straight Gin, Canasta, Contract Rummy, 500 Rum or Pinochle, Double Rummy, Knock, Continental, Kalookie Rummy Version, Pan or Panguingue and Kalookie. Moreover, there are 30 local Rummy varations at Rummy Facts-Trivia Report to add to this long list. Aces High: refers to a rummy game in which aces have a higher point value, however A-2-3 does not. Alternatively, aces can be both high and low for some rummy versions. Aces Low: conversely, A-2-3 is valued at 1 point, but not Q-K-A. Add-on: used to describe a single card that is intentionally discarded to a player’s opponent for the purposes of adding to a meld. It's tough to toss, I know. Advertising: otherwise referred to as chumming, fishing, or baiting, advertising is used to identify the act when a player intentionally discards a single card in order to cause another player to discard a single card of a similar rank, suit and/or sequence. Angling: also known as side baiting or sideways fishing and is used to describe the act of a player intentionally discarding a single card in order to force another player to discard a single card a single rank away from the card discarded. Example: player tosses a 10 clubs and opposing player, thinking that player is not saving 10s, will toss a 10 from their hand. Ante: bet wagered by all players before the deal. Amount is determined by all players or posted before tournaments begin. Baiting: term also known as advertising, fishing, tempting or chumming. Jargon refers to strategic play to bait an opponent into tossing a card of the same rank or suit. Base/Basic: used to describe the sum of the player’s bonuses rather than the value of melded cards. This term is used in the Canasta form of Rummy. Blind Discard: used to describe the moment when a player discards a card without any knowledge whether or not another player in the game will find the card useful. Blitz: another term for shutout. A big time win! Block: defines the act of holding onto a particular card in order to prevent another player from using that card to meld their cards. Box: a deliberate entry onto a score sheet. Box Score: actual score that a player receives for winning a deal. Boxes: used to describe awards equivalent to 25 points for gin, gin off, or a knock. Bonus Box: an additional score one receives when they win the game of Rummy. The bonus box is traditionally worth about 25 points. Canasta Rummy: version of Rummy where seven cards of the same rank are melded (a natural canasta). 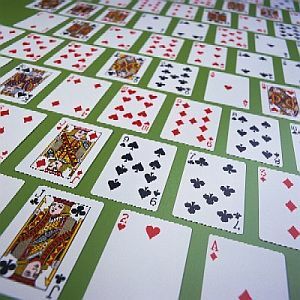 When playing Canasta, if the player has anywhere from one to three wildcards in his or her hand, it is known as a mixed canasta. Captain: game contest pitting 1 player against 2 who alternate their play versus the Captain. Combination/Combo: matched set of two cards that is completed by a third card deemed suitable. That's a nice fit! Concealed Hand: player’s hand in Canasta and Oklahoma Gin rummy versions that is out of the game quickly and has not made any melds. Continental Rummy: this version can be played by a large group of people. Each player is dealt 15 cards in sets of threes and the objective of winning is to form sets and runs from all cards. An exception for this version is that only sequences are counted in Continental Rummy and not matched sets. Contract Rummy: this version is perhaps one of the most played rummy games. A series of about five to seven hands are dealt and each different hand has its own set of rules that determine how a player can go out and how one wins the points. Example: a deal might require a player to have one set and one run before he/she can go out. Another might require two sequences or two sets, etc. Count: used to describe the point value of particular hands after subtracting the melded cards’ total. Cut: term for placing the second part of the cut on the first part, thereby changing the order of the cards after the shuffle. Rummy Games Glossary is the introduction for Rummy that has 6 parts .